WASHINGTON ?The White House is asking Congress to significantly boost funding in2011 for aplanned civilian weather satellite system as lawmakers draft a budgetmeasurethat would hold spending on most other federal programs to 2010 levels,according to government and industry sources. WithCongress having been unable to pass anyspending bills for 2011, thefederal government hasbeen operating since Oct. 1, the start of the fiscal year, under aseries ofstopgap measures known as continuing resolutions, which typically holdfundingto prior year levels. A finalcontinuing resolution that would fund the government for the remainderoffiscal 2011 could be introduced in the U.S. House of Representatives asearlyas Dec. 8, and the White House has requested that the measure includeanadditional $528 million forthe Joint PolarSatellite System(JPSS), sources said. The JPSSprogram was established after the White House dismantled the jointcivil-military NationalPolar-orbiting Operational Environmental Satellite System (NPOESS) inFebruary. NASA wasdirected to build the JPSS on behalf of the National Oceanic andAtmosphericAdministration (NOAA), while the U.S. Air Force is pursuing a militarysystem separately. NOAArequested $1.06 billion in 2011 for JPSS, which will utilize hardwaredevelopedunder the NPOESS satelliteprogram. The $382million appropriated forNPOESS in 2010 would be the amount the agency can spend on JPSS in 2011under afull-year continuing resolution unless Congress were to make a specificexception to provide more funding. Inanticipation of a full-year continuing resolution, the White HouseOffice ofManagement and Budget sent a list of proposed budget changes forhigh-priorityprograms to Congress Dec. 2. The so-called anomaly request did notinclude anymore money for JPSS, sources said. However, a revised request deliveredDec. 6included an extra $528 million for JPSS, for a total of $910 million,if it isapproved by lawmakers. The WhiteHouse also asked for more money for the Air Force?s GPS 3 satelliteprogram fora next-generation globalpositioning satellite system. 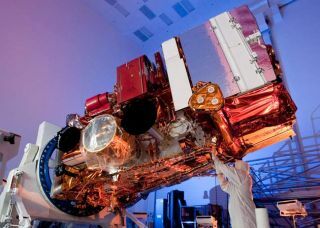 The servicerequested $194.8 million in 2011 to begin long-lead procurement of GPS3satellite hardware. New procurement programs are not allowed to beginunder acontinuing resolution, and thus the White House asked Congress providefullfunding and allow procurement to begin, according to documents obtainedby SpaceNews. Thisarticle was provided by Space News, dedicated tocovering all aspectsof the space industry.